Gardening: Spring 2013 - Berries oh my! Spring 2013 - Berries oh my! Spring is finally here! I celebrated by planting a few hardy items in early March. 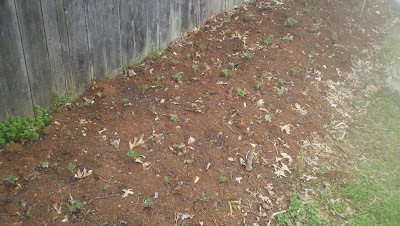 Here you can see some snow and sugarsnap peas coming up. I've planted some beets in with them, and potatoes in the rows. A little further back we have Swiss Chard, Lettuce mix, Spinach, and Radishes. I may have then gone a little overboard, but I seriously wanted some berries and things in the garden. So also around the first of March, my shipment from Burgess arrived. Needless to say it was a tiring week of digging, fertilizing, and planting. But it has started to pay off already, just 1 month later.